To this day, whenever I give my 5-year-old a muffin, he asks me "Is there Zucchini in it?" 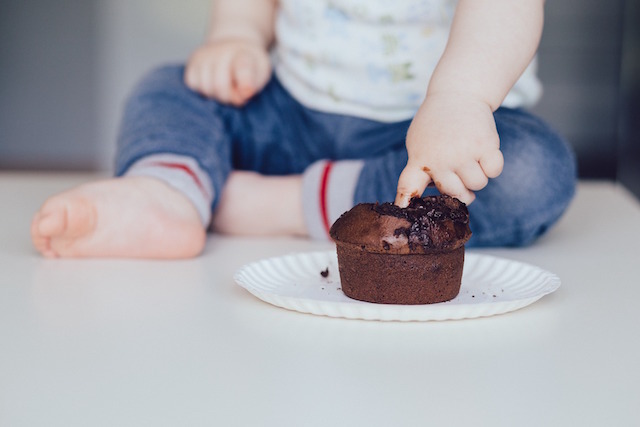 As a picky tot, muffins were one of my favorite ways to sneak in an extra veggie—until he learned my tricks. But if there's one thing he can't resist, it's chocolate, and these muffins offer up a double dose of that. They taste decadent and super chocolately, but they're also packed with not 1, not 2, but 3(!) types of fruits and veggies: a hefty dose of zucchini, banana, and applesauce. The end result is something so rich, that you would never guess they're good for you. Make a big batch, and stick them in the freezer so you can pop one out for lunch boxes or heck, even breakfast. They'll keep for up to three months in the freezer in an airtight container or for 2 days in the refrigerator. Ingredients: 1 1/4 cups whole wheat flour 1/4 cup unsweetened cocoa powder 1 teaspoon baking soda 1 teaspoon salt 2 ripe bananas 1/4 cup olive oil 2 eggs at room temperature 1/3 cup sugar 1/2 cup unsweetened applesauce 1/4 cup milk 1 teaspoon vanilla extract 2 cups shredded zucchini (about 2 small) 1/2 cup mini chocolate chips Directions: Preheat oven to 350 degrees. Spray two 12-cup muffins tin with cooking spray. In a medium bowl, whisk together flour, cocoa powder, baking soda, and salt. In a large bowl, mash bananas until no big lumps remain. Stir in oil, eggs, sugar, applesauce, milk, and vanilla until combined. Add zucchini and mix. Stir the flour mixture into the wet ingredients until just combined. Mix in chocolate chips. Using a 1/4 cup measuring scoop, divide batter evenly into prepared muffin tins, and bake for 20-22 minutes.